I’d like to dedicate this entry to my impression of acquaintance with the gel polishes. Before now the only thing I did was reading other people’s articles about similar procedures. But then a perfect occasion happened (I’m going to share it with you at the end of this entry), so I decided to try all the new technologies by myself. 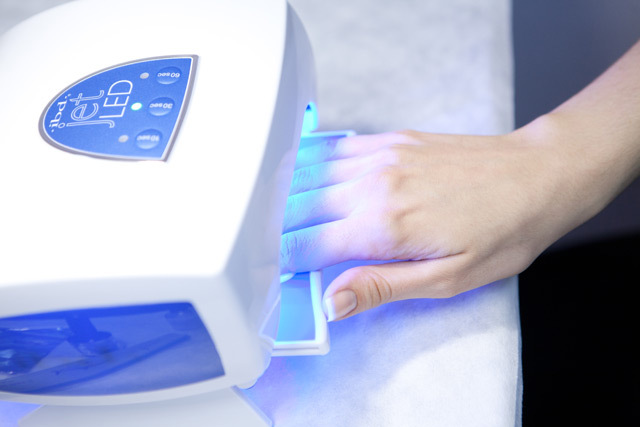 Then the manicurist removes slightly the gloss from my nails with the help of a polisher called Sand Shark II. 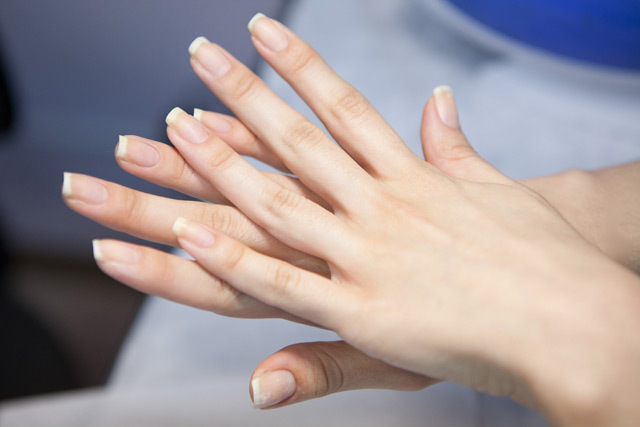 After it’s done, your nails and hands get treated with an antiseptic called Nail Prep by ibd for degreasing and removing of nail dust. This is how design looked like on tips. Here’re the "main characters” of this entry. 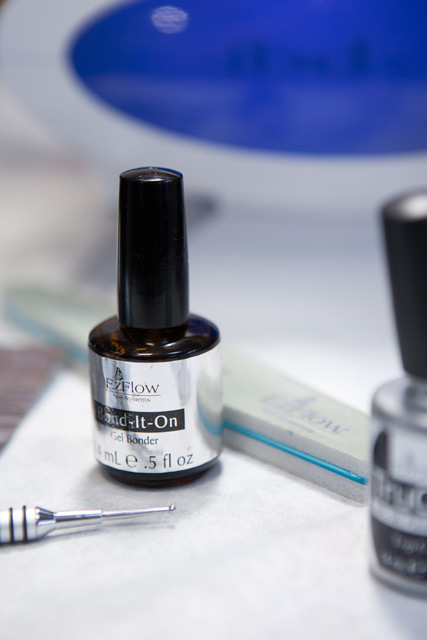 They’re the dotter for mixing dark gel polishes TruGel by EzFlow, blue and black gel polishes called Nautical and Lil Dress for creating a nail design. 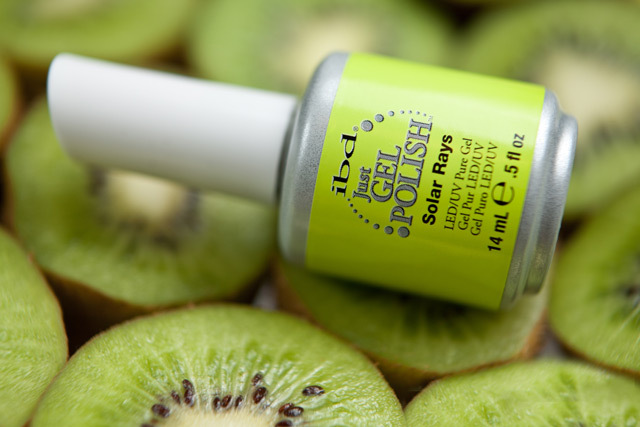 Neon Solar Rays Just Gel Polish by ibd is the basis for painting. 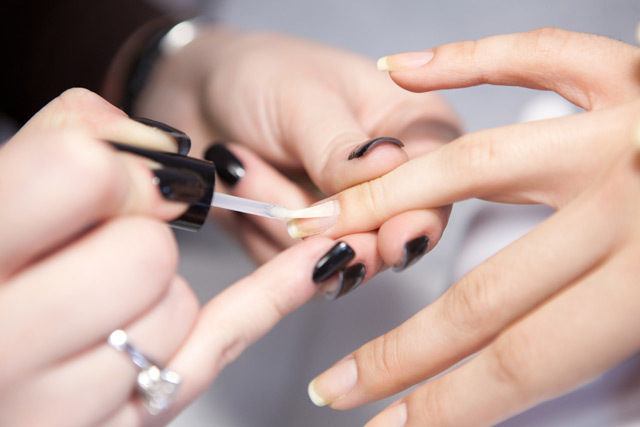 Before applying a basecoat on your nails they must be covered with the bonder called Bond-It-On which is used for better adhesion between the nail and gel polish. 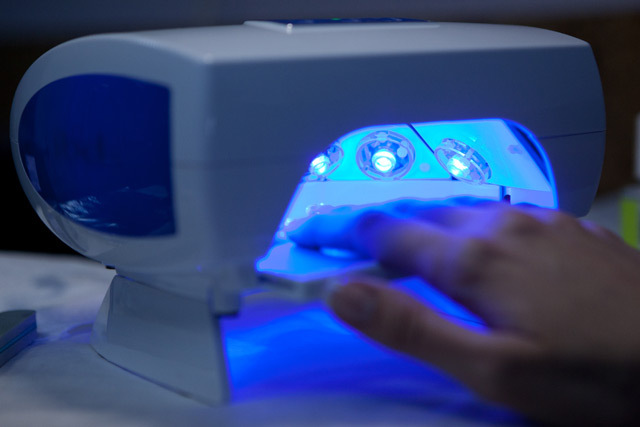 Bonder gets dry in a natural way with no lamp use. 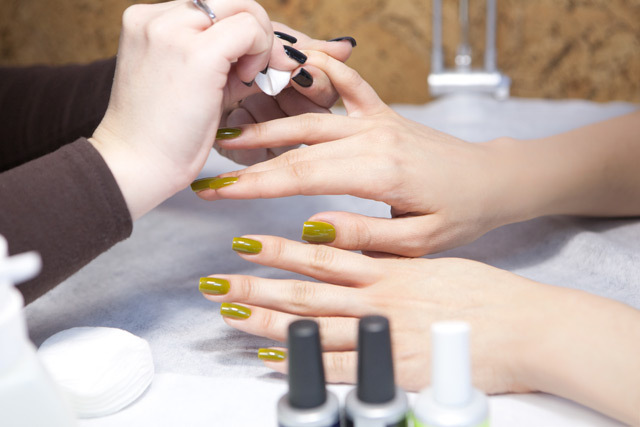 After the bonder is applied, your nails get polished with a thin layer of basecoat called TruGel Base Coat. First time LED lamp use for my nails. Neon nail lacquer is going to be used as a main shade in the manicure. To make it even brighter, first layer is done with a white cream gel polish and then dried in the lamp. First layer of neon nail lacquer applied over the white one looks almost transparent. But this makes my nails shine in such an effective way in the lamp! 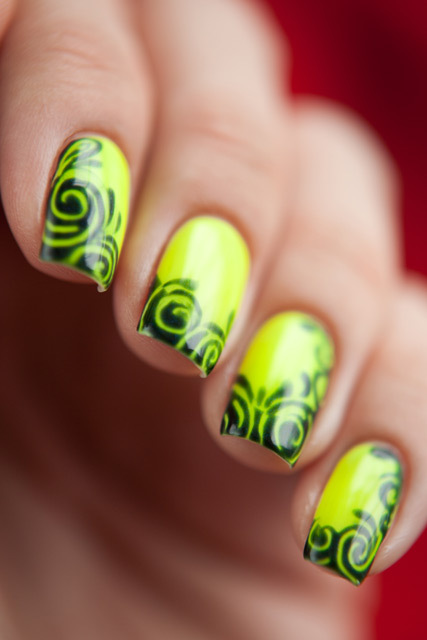 Second layer of neon nail lacquer completely transforms the nails. Gel polish looks perfectly even and very saturated. The manicurist mixes separately a few drops of blue and black nail lacquers for creating a necessary unique shade. 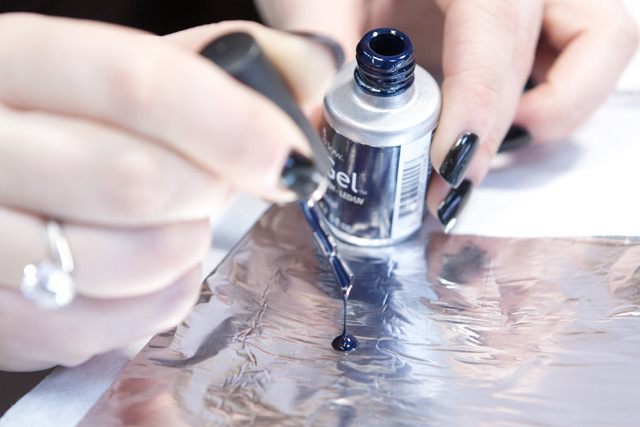 A part of nail gets covered with a dark blue-black lacquer from the palette. And here is a process begins which is practically cannot be replicated with the help of usual nail lacquers. Using a dotter the manicurist makes a movement on a fresh gel polish and it looks like it runs up the side leaving no grooves and pits as usual nail lacquers do. 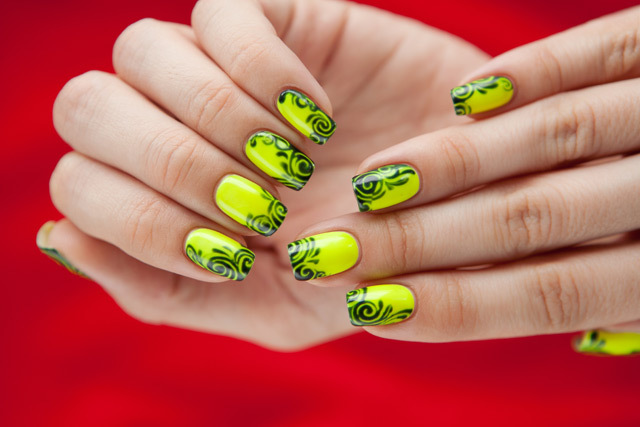 What gel polish leaves is a thin track exactly in that place where it must be due to the artistic vision. Then the manicurist finishes the necessary elements for the final nail design with the help of a thin brush. The last step is drying under the lamp rays. Ready manicure gets shine and strength thanks to the top coat called TruGel Top Coat. And then comes the final drying in the lamp. 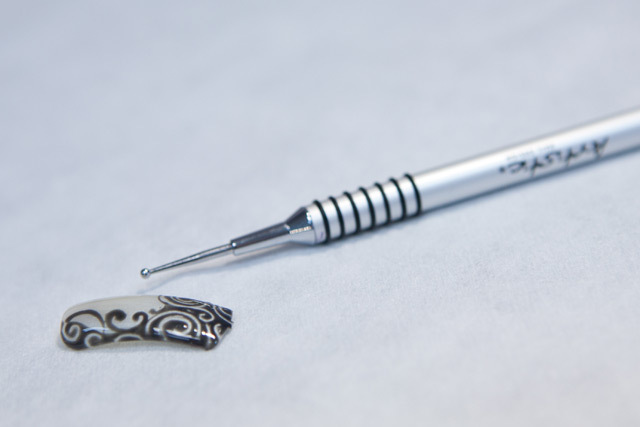 At the end an adhesive layer gets removed from the nails and cuticle gets treated with oil. And now let’s speak about my impression of this procedure and its results. I felt no discomfort during nail lacquer application. Everything was going fast and carefully, with no rush. All the movements were accurate and professional like. The only thing that impressed me much was a burning feeling during the lacquer drying after the top coat application. But it’s gone fast. It was interesting to know I could touch my nails right after finishing the manicure and engage in any activities without a risk of polish damaging. In spite of a number of layers, the coat didn’t seem to be anything bulging or strange. I was totally excited with the final design results! I would never manage to make anything like that with my nails. I’ve been wearing that manicure during eight days and made those pictures on the sixth day. I wasn’t bored with the nail design during that period of time. I really miss it now. Coat gloss was in a perfect condition all this time; it didn’t fade away or get scratched in no circumstances. Now I realize that unfortunately there is no other usual nail top coat with such properties. First several days I’ve been constantly checking the condition of a nail end. But to my pleasure the coat didn’t change a bit on it for those 8 days and my nail ends were in a sealed condition just like the manicurist had left them. You can see it on a few macro pictures below. I removed the gel polish with the help of nail enamel remover containing acetone. It took 10-15 minutes to make a lacquer soft in foil and it got removed from almost all the nails by itself with thin stripes. I removed its remains in some places with an orange stick. The whole procedure seemed less harmful for a person who got used to remove glitter polishes in much more severe conditions. Nails looked healthy and not damaged. I removed the gel polish only because my nails grew fast and the distance between the coat and cuticle increased hugely day by day. I’m sure it would not make much difference for the majority of you, but I got used to apply a lacquer as close to the cuticle as possible. The manicurist made a semicircle near the cuticle perfectly even, but this fact didn’t save me from the regular thoughts I had to renew my manicure. Though, it was really pity to say good-bye to really unusual and unique nail design. The procedure was provided by Victory Company. The manicure was made by Elmira Tsyupina, the Victory Training Center teacher. What to choose: acrylic or gel? 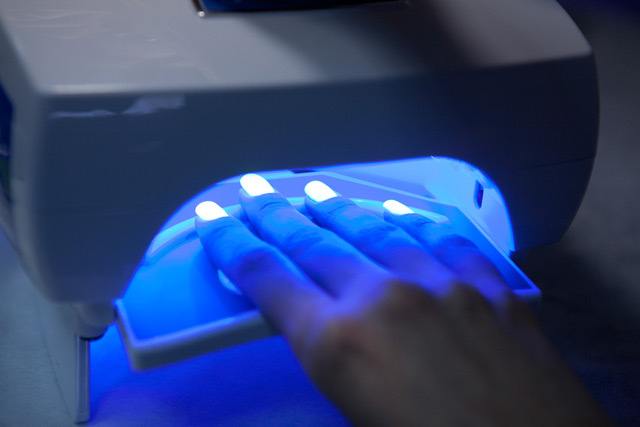 Biogel or gel nail polish?